Why choose a water heater? Its a well known fact that starting an engine from cold is not only inefficient, but increases component wear and thus decreases engine life. This results in not only higher fleet operating costs, but more increased fuel requirements and vehicle downtime. Webasto water heaters provide the ideal solution to eliminate these problems. 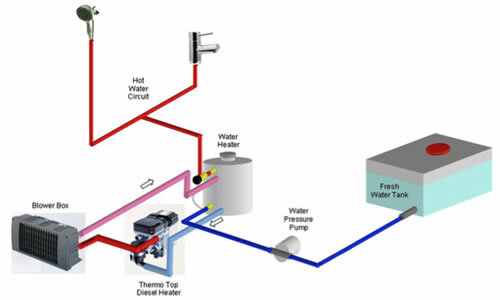 The water heater is integrated into the engine’s own coolant circuit and brings all fluids and components up to the optimum operating temperature even before starting work. Our comprehensive range of water heaters with outputs from 2.2 up to 35 kW ensures that there is a heater to suit every application. So the engine start is guaranteed even at low outside temperatures. Furthermore, the driver’s cab is pleasantly pre-heated. 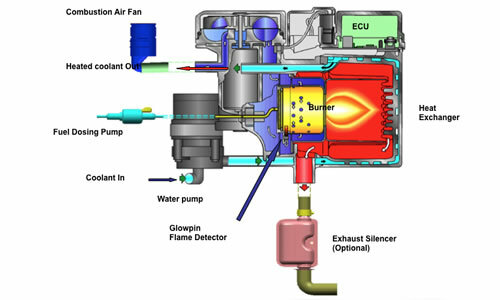 This eliminates the need for fuel-intensive idling while stationary and during rest breaks.